This End Times Deception Bible Study will cover the prophecies of the Little Horn and the 2,300 days in Daniel 8. 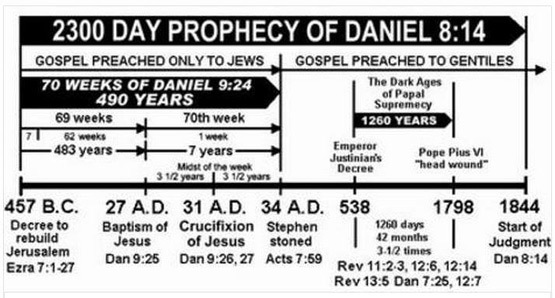 SDA, Seventh Day Adventist, Pastors teach that the prophecy in Daniel 8 is about 2,300 years, which occurred from 457 B.C. – 1844 A.D. They apply the 1 day = 1 year to the prophecy to say it was 2,300 years, but that principle doesn’t always apply. In Daniel 12, the 1,290 and 1,335 days were actual days, not years, which has caused SDA’s and others to stumble. They proclaimed that 1844 was the year that the Messiah would return, but when that didn’t happen, they said that it was the beginning of His Investigative Judgment. This study will show that the two thousand and three hundred days was in fact exactly that, 2,300 days, which was six years, and three and a half months, that was fulfilled from 171 – 165 B.C. Because it was already fulfilled, the SDA explanation is invalid, which we already knew since the Messiah didn’t return in 1844. Someday I plan to do an in-depth Bible study on Daniel 8, but for now here are the notes from the Geneva Study Bible, which were written by some of the Protestant Reformers. A key principle that the Lord taught me was to look to theologians who taught before most of the deceptions crept into the Church during the last few centuries. The Geneva Study Bible was published in the 16th century. And out of one of them came forth a (l)little horn, which waxed exceeding great, toward the (m)south, and toward the (n)east, and toward the (o)pleasant land. l. Which was Antiochus Epiphanes, who was of a servile and flattering nature, and also there were others between him and the kingdom: and therefore he is here called the little horn, because neither princely conditions, nor any other thing was in him, why he should obtain this kingdom. m. That is, towards Egypt. n. By which he means Ptolemais. p. Antiochus raged against the elect of God, and tread his precious stars underfoot, who are so called because they are separated from the world. q. That is, God, who governs and maintains his Church. r. He laboured to abolish all religion, and therefore cast God’s service out of his temple, which God had chosen as a little corner from all the rest of the world to have his name there truly called upon. s. He shows that their sins are the cause of these horrible afflictions: and yet comforts them, in that he appoints this tyrant for a time, whom he would not allow to utterly abolish his religion. t. This horn will abolish for a time the true doctrine, and so corrupt God’s service. u. Meaning that he heard one of the angels asking this question of Christ, whom he called a certain one, or a secret one, or a marvelous one. x. That is, the Jews’ sins, which were the cause of its destruction. y. That is, which suppresses God’s religion and his people. z. Christ answered me for the comfort of the Church. a. That is, until so many natural days have passed, which make six years, and three and a half months: for the temple was profaned this long under Antiochus. For a more detailed explanation, John Gill’s Exposition of the Bible is an excellent resource, which was written in the 18th century.